The spirit and diversity in the beer industry come from its people. The men and women who do more than just make beer: They inspire, educate and innovate, and they elevate the beverage beyond the glass. Several months ago, we asked the journalists who work for All About Beer Magazine to nominate people in the beer world who they believe are making a difference. There are brewers included, of course, but there are many others who rarely venture near a mash tun, but rather are finding ways to promote beer, create new inventions or advance beer culture. 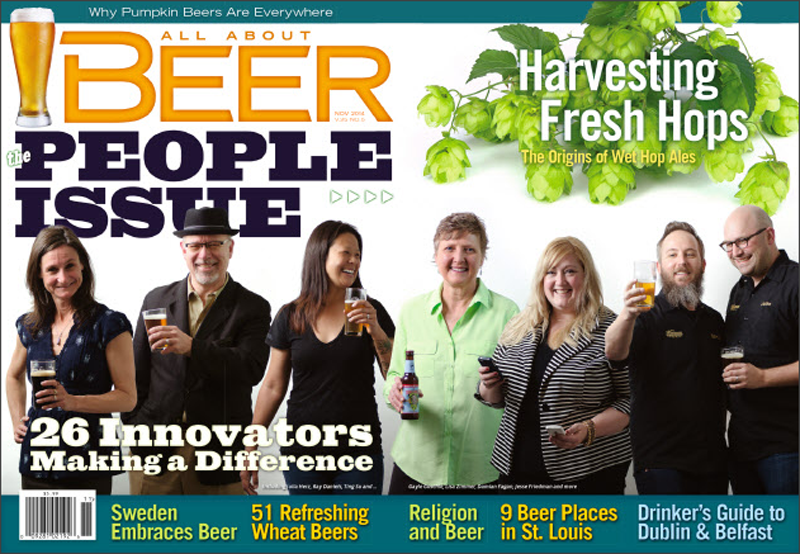 You can read all of the profiles in the November 2014 issue of All About Beer Magazine, and we’ll also be sharing some of the profiles here during the coming weeks. Interviews and profiles by Tom Acitelli, Jeff Alworth, Erika Bolden, Randy Clemens, Stan Hieronymus, John Holl, Ben Keene, Tara Nurin, Dan Rabin, Adrienne So, Heather Vandenengel, Gerard Walen and Brian Yaeger. Surprised Meg Gill didn’t buy herself onto the list, oh wait, they actually asked journalist. Sorry Meg, better luck next time. Hello, I was kind of surprised that you chose to highlight people with major breweries and none of the small guys doing great things with beer!! like Chuckanut (our brewmaster has been around since the early 80’s and set up breweries across the world), Fremont, Elysian, and so many more across the USA. Hello. Just speaking for myself, I’d struggle to call more than one of the 7 breweries represented as “major breweries,” but even including the ones that pass as oxymoronic macro micros, there are 3 on this list that are smaller than Chuckanut. I get that you have a job to do, but it’s not kind to throw shade at other small guys doing great things with beer just like your brewery does. Thanks to All About Beer Magazine for shining a spotlight on the people behind the Hand Craft Beer Industry. As we push to make better beers, the world will toast to the hands that helped the Draft that turned to Craft, and built one of the strongest industry called The Hand Crafted Beer Industry. cheers from Jay the Welder ……….Brew On !!!!!!! !